Next Room Eavesdropping Device | OhGizmo! The next time you leave a room you don’t have to wonder what everyone is saying about you. 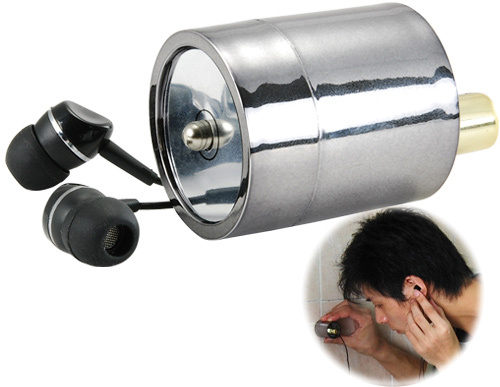 You can simply whip out this compact eavesdropping device and find out for yourself. It looks a bit like the business end of a stethoscope, but uses an electronic internal sound amplifier to boost the noises coming through a wall, door, window and even steel plates. (So you can listen in on conversations inside a tank?) It’s rechargeable via USB and includes a set of headphones you’ll probably want to instantly dispose of, and is available from ChinaGrabber.com for $62.99. I don't even want to hear what people are saying in the same room as me. First the night vision camera and now this…..make me wonder what the people at ohgizmo are up to…..
they are trying to rally a mass exodus from the darkness of our rooms only lit by the dim glow of the computer. I agree, if you feel the need to check in on the people who you were in the room with then maybe you should just not be with them to begin with. A glass to the wall would be cheaper. Ya that seems pretty pricey considering that you could buy a real stethoscope on eBay for less than $10. You could even electronically amplify the stethoscope by taking a pair of ear buds and plugging them into the rubber tubing where there the listening buds would normally go. I've done this to record heart beats, it works pretty well. Looks like that the spy kids theme is popular again. With the new internet regulation act being viewed … probably kids want to play new games like “big brother” now…. I thought the same thing when i first read the title. I was like is OhGizmo trying to prepare us for a mission. I'd buy one if they weren't so expensive. Can't distinguish if this is helpful or not because eavesdropping is not healthy.